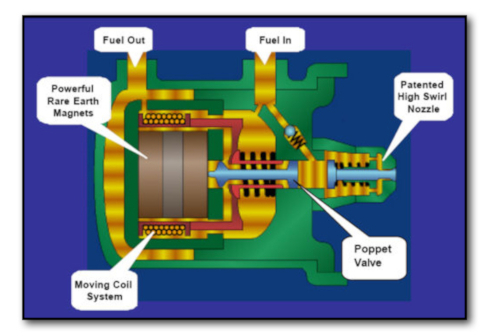 Ficht direct fuel injection was invented during the Cold War by an East German engineer named Herr Doktor Wolfgang Heimberg. 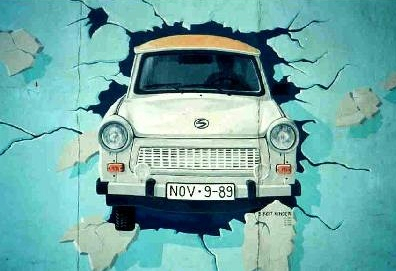 He envisioned his hammer pulse injection as a bolt-on for the Trabant automobile. Fiberglass body Trabants, with their 37 cubic inch, two-cylider engines, were notorious for spewing smoke and guzzling fuel. Heimberg wanted to clean up the Trabby's act for the sake of the environment and for fuel efficiency. But the Iron Curtain fell just days before his planned escape to the West. No problem. Heimberg relocated to West Germany and went to work for Ficht Gmbh, a research and development firm located in Kirchseeon, Germany. Ficht is the namesake of Reinhold Ficht a principal in the firm. Then came further development of the hydraulic shock method of injecting gasoline into a combustion chamber. Eventually, the Ficht blueprints ended up in Waukegan, Illinois for the perusal of Outboard Marine Corporation's engineers and money men. At that time. OMC was famous for building two-stroke Evinrude and Johnson outboard motors ranging form 2- to 300-horsepower. A deal was struck for the intellectual property rights. But unfortunately OMC went bankrupt and the assets were bought by Bombardier. Ficht evolved into Evinrude ETEC.